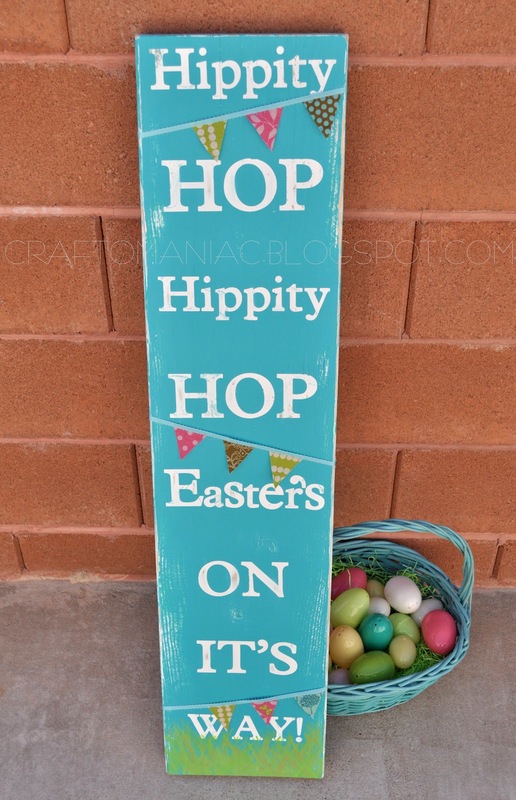 Make a Hippity Hoppity Easter Sign! 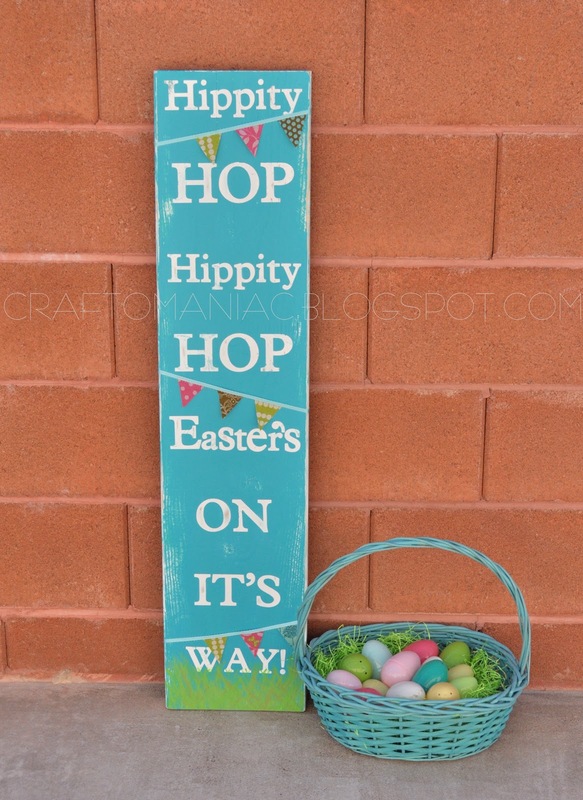 Make a Hippity Hoppity Easter Subway Art Sign! 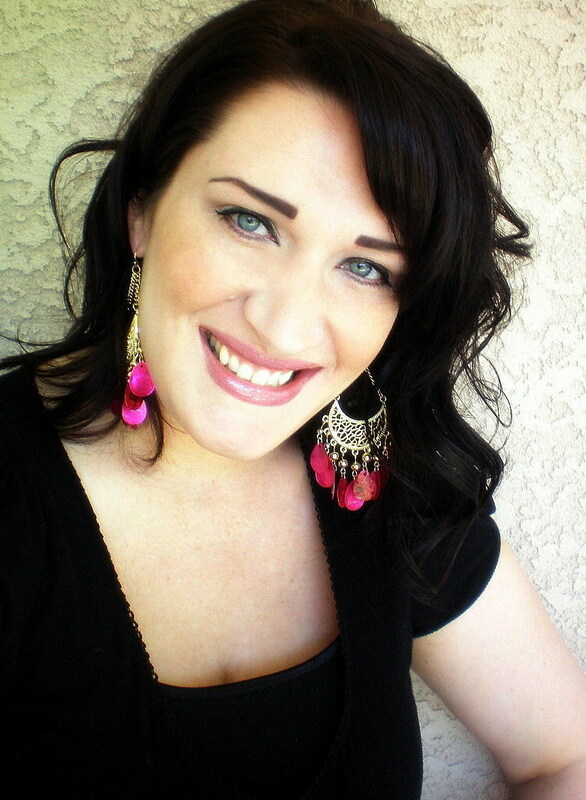 Hello TT&J fans, Jennie here from CraftOManiac. What a treat it is to be visiting once again. I just adore my visits here, thanks jen oodles. I headed off to Lowe’s to pick up a very long board, that I had cut down to size ” 9 x 40 1/2 inches. First I sanded the board, then painted the entire board 3 coats of acrylic white paint. Then I cut out all my words with my Cricut. I used the Platinum Schoolbook Cartridge. I transferred all my words onto transfer tape then onto the board and spaced each word 3 inches apart. 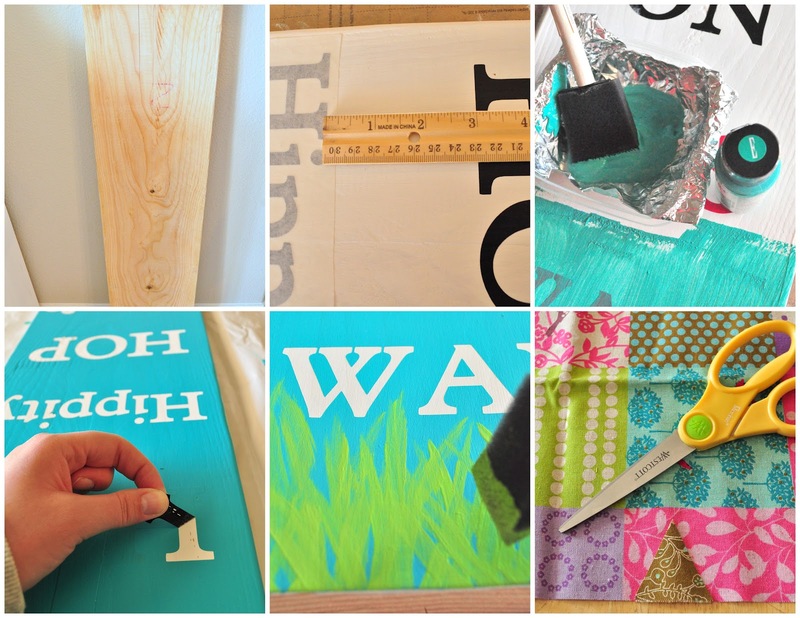 I then peeled off the transfer tape and painted the board a turquoise acrylic paint. Once it was dry I peeled off the vinyl, and sanded the board to rough it up where I wanted. Next I took some apple green acrylic paint and with the top of my sponge brush, brushed on grass streaks in different directions. Lastly, I made a cute pennant from some cut to size fabric. I hot glued each pennant piece to some ribbon and hot glued the small pennants to the back of the board. Thank you so much for taking a look at my project. Thanks again jen, love ya. What a fun Easter decoration!! Jen is living it up at Disneyland right now – check out her Disney Tote! And how springy and bright is Jen’s hutch? Love! 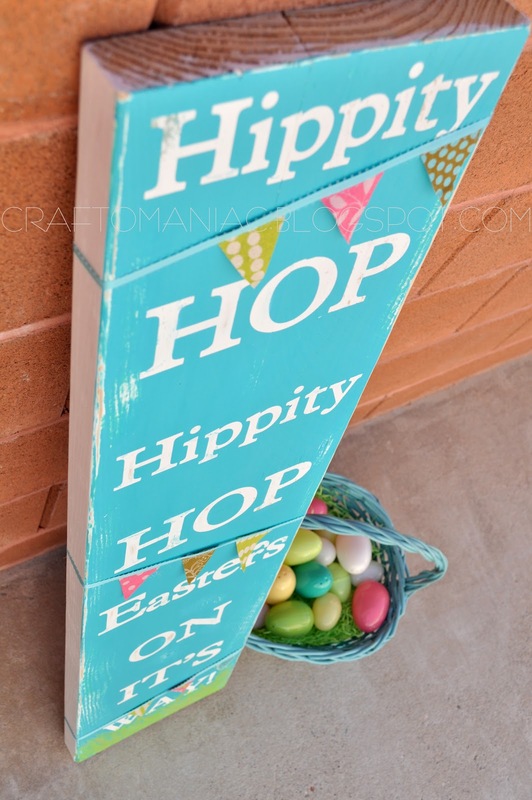 Great Ideas — 32 Inspirational Easter Ideas!! You Love Deals — Win a Beautiful Purse and Wallet!! Being Creative Can Be Messy! Hello, I was going to spend a fortune getting professional signs made up for our charity, but seeing your sign, it looks so professional and fun too. Im going to adapt it and make signs in a similar style. Thanks for the inspiration. Beautiful sign. I love this! I just finished one for myself. Thanks for the great tutorial!! I absolutely LOVE this. So fun! I love Easter! Love this cute Easter subway sign! The colors are just screaming spring! Cute, cute, cute! I need a few new decorations for Spring around here. Thanks for sharing this! Very cute project. Love the sign. How on earth do you not have any seepage from painting over those vinyl letters. I just did this and was 🙁 when I took the letters off. What type of vinyl are you using? I need to HoP to it and make one!! Love the Easter door. Man, how I wish I had a Silhouette or Cricut. That sign is SO cute! I totally love it! I was going to say the same… that kind of thing drives me crazy. 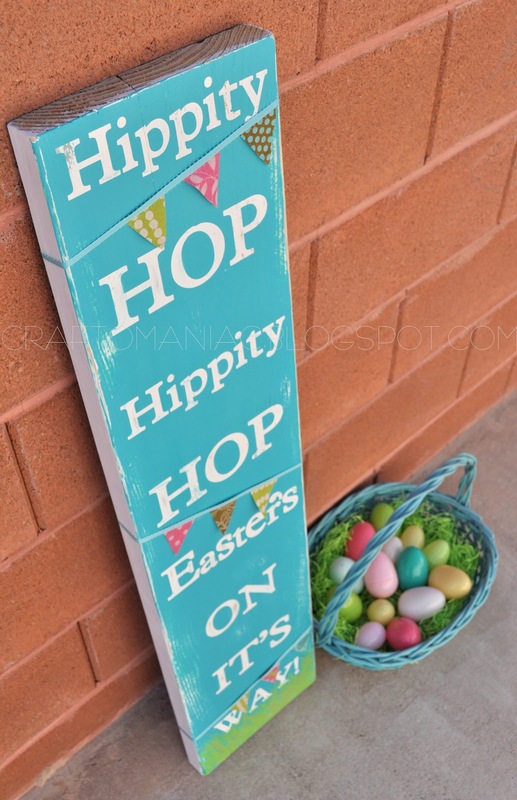 The Hippity Hoppity would leave me laughing with joy in the street if I were to see it on a random corner! What an adorable sign! Great job! That is adorable!! I love it! !